Alpha Charter Guild members join AV Hospital Administrators at the check presentation. (L to R) Wynne May, Dennis Knox, Fran Marroquin, Phyliss Reily, Beverly Horwedel and Antelope Valley Healthcare District Board Member, Doddanna Krishna, M.D. 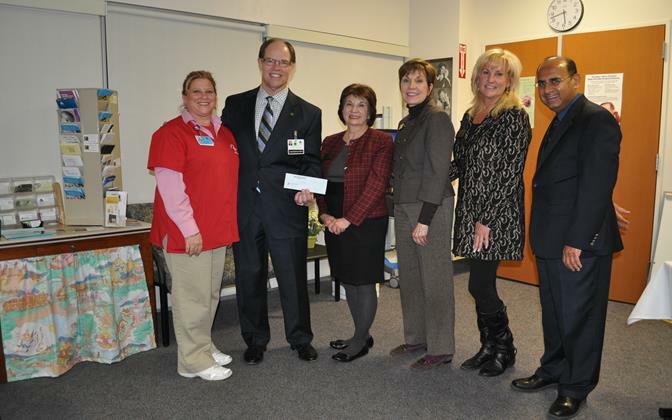 LANCASTER — The Alpha Charter Guild recently presented Antelope Valley Hospital (AVH) with a check for $45,000, the result of fundraising during 2013. The donation will benefit the hospital’s Resource Center and Women and Infants Pavilion. The Guild exists to build a healthy community by supporting programs and services that enable AVH to provide high quality care to patients. In honor of the Guild’s 50th anniversary, the 2014 president, Phyliss Reily, has set the fundraising goal at $50,000. 1 comment for "AV Hospital receives $45K donation"
Congratulations and thank you Alpha Charter Guild. Let’s hear more about you….